Robert McCollum is a successful marketing director-turned-stage, improv and film actor; commercial voice artist, writer, producer, director and well-known voice actor for FUNimation Entertainment. For two years, he was seen each weekday as the host of WFAA-TV's Good Morning Texas, and still serves as producer and contributor. With FUNimation, his credits include Baki the Grappler (Baki), Dragon Ball GT (Goten), Yu Yu Hakusho (Sensui), Witchblade (Yusuke Tozawa), Kaze no Stigma (Kazuma), Sengoku Basra (Date Masamune), Suzuka (Yasunobu), Peach Girl (Toji), Romeo X Juliet (Curio), and One Piece (Donquixote Doflamingo). Robert was also featured in this yearâ€TMs movie release of Summer Wars as Yorihiko Jinnouchi. Other credits include Speed Grapher (Niihari), Sands of Distruction (Toppy), RIN (Kouki Maeno), Nabari No O (Yukimi), Initial D: Fourth Stage (Wataru), Birdy the Mighty Decode (Kesiuke Muroto), Chrome Shelled Regios (Savalis), D Gray Man (Suman Dark), Tower of Druaga: Sword of Urik (Uragon), and Strain (Ralph Werec). 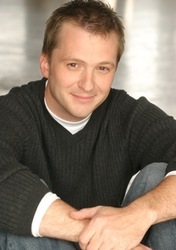 In addition to extensive work on-camera, hundreds of commercials, industrial videos, and games, Rob has been heard as the voice of Church's Chicken and Taco Bueno. And if you worked at Pier One in the early 2000's, Rob's videos trained you.